Luach Birkat HaNehenin, with the order of handwashing, by R. Shneur Zalman of Liadi – the Baal HaTanya. Zhovkva, . The words "In the community of Shklow" are emphasized and enlarged on the title page, while the place of printing, Zhovkva, is indicated in smaller letters. Edition printed in the lifetime of the author, the Baal HaTanya. Several editions of this composition were printed in the Rebbe's lifetime, yet most did not survive, and of some only one copy is extant. The purpose of Luach Birkat HaNehenin was to set down the laws of Berachot as ruled by the Baal HaTanya, in a concise format. The bibliographer R. Chaim Lieberman surmised that the composition was named Luach – plate, since it was originally printed as a broadside intended for posting on the walls of synagogues and study halls (similar to calendars and other synagogue posters). The Baal HaTanya first established his rulings pertaining to the laws of Berachot in the Shulchan Aruch he authored (while in Mezeritch, 1772-1773). The Shulchan Aruch was only printed after his passing, in Kopust 1816, though prior to that, the Rebbe composed this Luach with abridged laws for practical application, based on his Shulchan Aruch. This composition was printed in his lifetime and follows the rulings appearing in the Shulchan Aruch of the Baal HaTanya. The Baal HaTanya later wrote a third composition pertaining to the laws of Berachot, named Seder Birkat HaNehenin. This composition too was printed several times in the lifetime of the Rebbe, within his siddur, and its rulings differ from those appearing in his Shulchan Aruch and Luach. While in the latter compositions he ruled following more recent halachic authorities such as the Magen Avraham, in Seder Birkat HaNehenin, he reconsidered and ruled according to the Rishonim. Ownership inscription on the title page: "This Tanya by the illustrious Torah scholar and master of the entire diaspora, belongs to the outstanding R. Ze'ev [?]". , 2-27,  leaves. Approx. 18 cm. Good condition. Stains, dampstains. Light wear. Several tears, slightly affecting text. Perforation to inner margins from past binding. New leather binding. 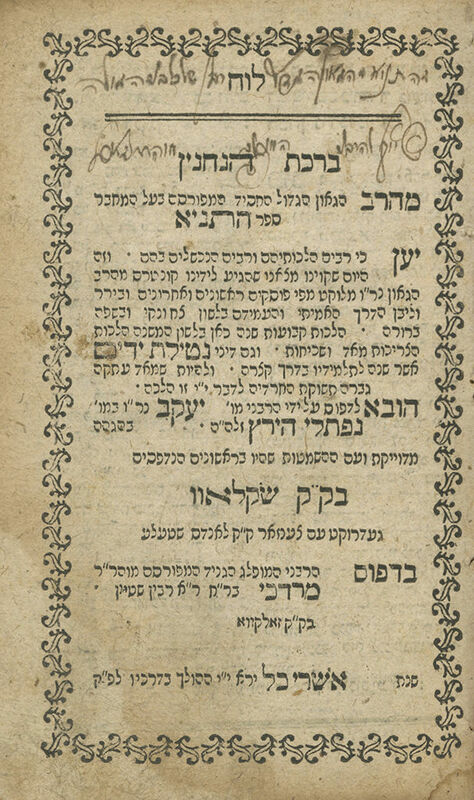 The publisher of this edition, R. Yaakov son of R. Naftali Hertz of Brody, also published the second edition of the Tanya, in Zhovkva in 1799. Stefansky Chassidut, no. 262. See: Lieberman, Ohel Rachel, I, New York 1944, p. 144; Mondschein, Sifrei HaHalacha shel Admor HaZaken, New York 1984, p. 202 onwards.